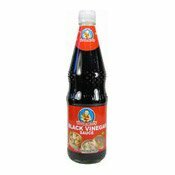 Add mild sour taste to your soup and stew with a few drops of "Healthy Boy Brand" Black Vinegar Sauce. It is best especially to enrich delightful taste of fish maw soup as well as dim sum. Allergy Advice: Contains Soybean, Wheat. Close the cap after opening and keep refrigerated. Avoid heat and sunlight. Protein sediments are natural and harmless. Ingredients: Vinegar (51%), Water, Glucose Syrup, Soy Sauce (Salt, Water, Soybean, Wheat Flour), Salt, Spices (Coriander Seed, Fennel, Orange Peel, Cinnamon, Clove). Simply enter your details below and we will send you an e-mail when “Black Vinegar Sauce (黑醋)” is back in stock!